Suthon Island protects the world with the power of a giant palm tree. When the evil Omminus takes over, the palm tree withers and the nature spirits decide to awaken the hero Zip and send him to retrieve the pearls spoken of in legend that will restore peace. 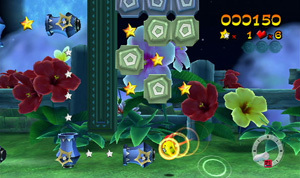 As the screen scrolls, you have to use the Wii Remote Plus to hit Zip through the stage. He bounces around, breaking blocks and hitting enemies. Find three medals in each stage to uncover the Pearl, and uncover the three Pearls in each World to face the boss stage. You are given a rank upon completing each stage which can be used to unlock minigames.